It was May, 1995, a rainy spring in Seattle, when Sir John Gielgud told me—all right, he wasn’t speaking to me personally, but I heard his words as if they were meant for me alone—that there is nothing so remarkable as friendship. For friends, we often do things with no expectation of return. He imparted this wisdom with a sidelong glance and his sly smile, as if telling me something we both already knew, a common truth upon which everyone agreed. Except it wasn’t a common truth. Not for me, and I told him so, frankly. Sir John stayed on for the next few days, following me from room to room, recounting tales of friendship through the ages. We argued back and forth. He gave me Achilles and Patroclus. I gave him Becket and Henry. To his Adams and Jefferson, I put forth Caesar and Brutus. When he said Hope and Crosby, I said Tupac and Biggie. But I couldn’t dismiss Sir John’s assertion out of hand—living legends can have that effect—so I continued to ponder his words. Why did he see as basic something that to me seemed so foreign? Naturally, I wanted friendship to be as he described—I expected it, in fact—but life had taught me otherwise. Based on evidence, friendship was transitory, inconstant, and ultimately a source of pain. We had reached an impasse and sat silently in the living room, he with his paper, me with my book, both of us waiting for inspiration to freshen our debate. The little answering machine—all putty-colored plastic and red LEDs—played its spiel to the caller, after which I expected to hear the click and double-tone hum of yet another telemarketer’s denouement. This time, though, from the tinny speaker came a voice from my youth, a woman I hadn’t seen or spoken to in nearly twenty years. Alice, an old friend from high school, was a fellow survivor of the symphonic and marching bands. A couple years ahead of me, our friendship had never really bridged the upper-classman divide, but we had always been cordial, so I let her ramble on a bit. She was in Seattle—surprise!—and had heard that I relocated here. She just called to chat and catch up. She nattered on a bit, filling the void as she waited to see if I was merely screening calls or was truly not going to answer. About fifteen seconds in, Sir John cleared his throat. From over his evening edition of the Herald-Tribune he stabbed me with an arched-eyebrow glare, cocked his head toward the phone, and then returned to his perusal of the international news section. Alice, I said, and How long has it been? Our first words in two decades were banal clichés that might have come straight from an episode of Room 222 or Marcus Welby, M.D., but we quickly moved past them and on to the “catching up” phase. As Alice recounted the major events of her post-school-life, I was surprised to find myself smiling, laughing even. Her familiar voice, gravelly and hard-edged, pried open a long-closed, rust-hinged door and together we began inspecting the cobwebbed boxes stored in my memory. Old names flashed across neurons left brittle from disuse, evoking images of black-and-white yearbook smiles. Ancient histories rebuilt themselves, one remembered personality, one nostalgic event at a time. Teachers, friends, rehearsals, concerts, parades; we were awash in recollection and the dreamy-eyed innocence of our once eternal youth. And then she said the name I’d tried for years to forget, the name that leapt across the chasm of years, stormed the bastions of my brain, and began taking hostages. It is not a common name, Elin, with its long E and short I, and that is fitting. Elin was not a common gal. Thin, boyish, excruciatingly smart, with long-fingered hands and lanky hair the color of wheat at harvest-time, Elin Abington stood alone in the landscape of my youth, the keystone in an arch of mysteries and betrayals. For the most part, everyone whose life passed close to mine was knowable, sussable, comprehensible. The motivations behind their actions were sometimes obscure, even misguided at times, but eventually I was able to discern the logic that drove their behavior. Elin, however, was a great unknown, a single riddle orbited by a batch of lesser mysteries. The fact that we had been close, seemingly inseparable parts of a tight-knit quartet of friends, only deepened the pain. “No. She dropped from sight the February before graduation. Intentionally, it seems.” That was the truth. “I haven’t spoken to her since.” That wasn’t. Sir John rustled his paper. Even Alice thought it was odd that Elin and I hadn’t kept in contact. In the years to come, much will be lost to him. Many details will simply not make it past the blinkers of his mind’s eye, and many more will be lost to the unraveling threads of time, but even at five years old, much will survive for him to carry forward. He comes home from school, running up the hill, shoes scuffing the rough surface of the concrete sidewalk. The sun is bright despite the thin clouds. Past the last corner, he smacks the juniper in his neighbor’s yard, feels the sting of its prickly fronds and smells its sharp scent. He passes under the fading leaves of the Fillingame’s plane tree, kicking a path through the fallen litter. He looks up. His father’s car is in the drive. Dad is home? Already? First, 60 followers…wow! Thanks to each and every one. It still boggles me that you find my ramblings and musings of sufficient interest, but hey, Welcome! I’m glad you’re here. Now, to the subject at hand. There’s a book I want you to read. It is without a doubt the funniest, wryest, most engaging book about running you’ll even encounter. Don’t let the topic put you off. Yes, it’s a “marathoner’s memoir,” but that truly over-simplifies this insightful book. I don’t run anymore (bad knees) and I have never run a marathon nor did I ever attempt to run a marathon. I did not read this book because I wanted to be “inspired” to run a marathon. I read this book because (as the Acknowledgments will tell you) I know the author, but I want you to read it because it is simply a really good, funny, often laugh-out-loud read. 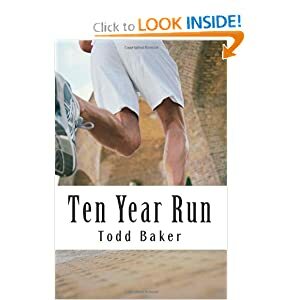 Todd Baker started out as an overweight asthmatic, and ended up running a marathon and carrying the Olympic torch during its path through Washington State. Along the way, he learned a lot—about running, about people, about himself—and with sharp wit, a gimlet eye, and self-deprecating humor, he has put this journey down for us to enjoy. If you like Bill Bryson’s work, you’ll love this. It’s available in hardcopy and in Kindle format, and I recommend it highly.